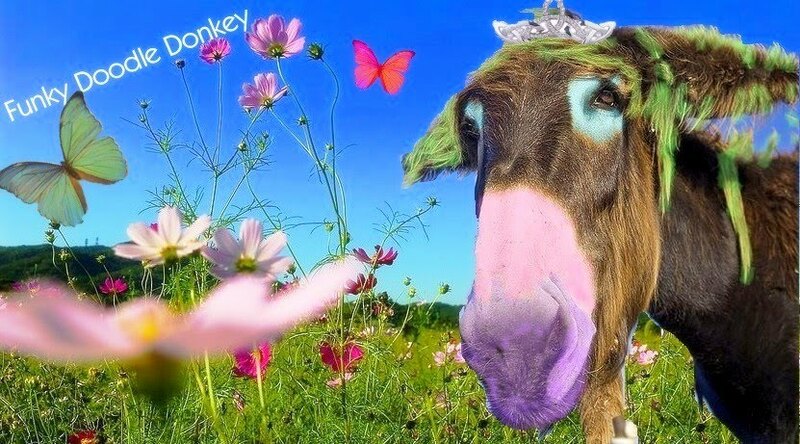 Funky Doodle Donkey: National Adoption Day! November is National Adoption Awareness month, and today is THE National Adoption Day! Each year I write something about the moment our life changed forever! The day that Jasmine and Juliet entered our lives... that day was: July 27, 2002 at 10 am I got a phone call from the Birth mother who I had met twice before, once to visit her daughters and help her to support with some powdered milk and other items she needed to keep these little bundles of joy worry alive. And the other time to go with her and the babies to the hospital to give them their shots and a check up. In her mind, the Bmother already had a plan for us... which I was totally oblivious of. See, our adoption was not done via an agency, on that day, July 27th, a month after I had seen the girls for the first time, the Bmother asked me at 10 am if I would like to raise her children, she took me by surprise!! But she explained that it would be good Karma for her if she would give her daughters a better chance in life. She had observed me for a while, she talked to my helper and she knew this was the best for her precious little babies. So how could I deny that offer?? I talked to Dirk about it and at 12pm, just 2 hours later we were the parents of these beautiful twins. Dirk laid eyes on them for the first time, he only briefly heard about my previous visits with the babies, so quite the change in HIS life too!! November is Adoption Awareness Month, and I know some of you out there are thinking, pondering, shall we go for this route?, shall we adopt? How hard is it, what are the hurdles? Are we prepared?? So were we prepared?? NO! Was it difficult?? YES! But wonderful at the same time! Was it daunting and were there moments that I had no clue what to do next?? YES! But wasn't it the most precious moment of all times in my life when I saw these babies and could not completely wrap my head around the fact that I was the mommy of not ONE but TWO gorgeous little faces and cute tiny bodies. 3 months old, I will never forget those first few days... overwhelming! But oh so precious!! We accepted the offer that changed our lives and went on from there... it took us 13 more months to make those little twin girls our official children! 13 months of agony, difficulty, desperation at times because the paperwork didn't go well at all!! And we weren't even sure if we could actually keep these babies!! What if they denied this private adoption?? After taking care of them for 13 months, till the LAST day I wasn't sure if we could keep them!! That part was hell!! I loved the fact of taking care of them, holding them, loving them, from day 1 they were MY babies. But everybody around me was thinking: "Who is she that she thinks that she can keep them?" There is NO private adoption law in Thailand, so that made the case so difficult, but in the end we prevailed. And we had the official documents in our hands and flew to the USA to start our new life as a family of four!! Dirk being transferred to the USA after 2 months when we got the girls, a journey of 30 hours from door to door to Thailand. Me alone with the girls on the other side of the world, going through all the firsts alone... not easy to say the least! Dirk flying every other month to Thailand just for a weekend to get some paperwork done, appear in front of the child protection board and be there in person for all the legal actions to adopt a child. Every time he flew twice for 30 hours, to be in the country maybe for 1 or 2 days, just to do the legal work and go back to his new job in the USA. Since we didn't plan this adoption, it came on our path, it's what happened to us overnight, so no long discussions beforehand about the pro's and con's of adoption. In an instant we were the proud parents of Jasmine and Juliet. Think of this story, when you are in the process of adopting but don't know for sure if this is the right thing for your family, and see the end result. Just keep in mind the big picture, don't worry about the little things, it will all work out!! To us this is the BEST instant decision we have taken so far in our lives!! So when you are thinking of adoption, don't think too long!! Go for it!! It will be the best decision in your life too! Believe me... I have been there! Adoption is a blessing in our lives! And as I said in our adoption announcement: "Miracles do happen!" I still believe in that statement. When we think about adoption, we often forget about the Bmother. For me, she is the hero of our story. The bravery and LOVE that it took to give not only one, but two children to a woman she merely knew but felt out of true devotion to her most precious possessions in life, that this is what she had to do. To me the gift of life is the easiest to accept but the hardest to give! Enjoy your day, and may this be a very special day! Hello Dear Friend!! Look at those beauties!! What a day to celebrate the joy and thankfulness of adoption!! Thank You my friends!! All of you have had the blessing of a precious child(ren) through adoption and it is mind blowing how special it is!! I didn't know this is how your adoption began. I knew you and Dirk were living in seperate countries like Joe and I were, and wondering everyday if we would ever get the adoption thru or would I just live in hidning until hse was 18. Oh the stress, so worth it. Wonderful poem or whatever you would call that about the birthmother, thats really awesome. See you can get on board with me, IVF did work just not like we initially planned. What a beautiful gift those girls are! I loved reading this and hearing your journey to them again. It's so amazing how adoption touches our lives.